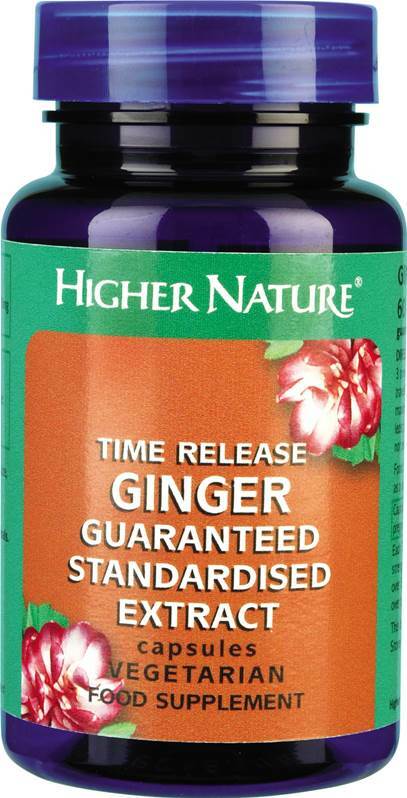 Higher Nature Time Release Ginger (size 60)- active components, gingerols. This special Ginger supplement releases slowly in the digestive tract for longer effect. Caution if pregnant or planning pregnancy. Ginger is the common name for the perennial plant Zingiber officinale. The active components, gingerols, are also responsible for the plant’s characteristic odour and taste. This special Ginger supplement releases slowly in the digestive tract for longer effect. Suggested Health Supplement intake: take 1 -3 capsules a day, or 2 hours before travelling. One time release capsule typically provides: 300mg Ginger (guaranteed standardised extract, 5%). No added: Sugar, salt, starch, wheat, gluten, maize/corn, yeast, lactose, dairy products, artificial preservatives, colours or flavourings.